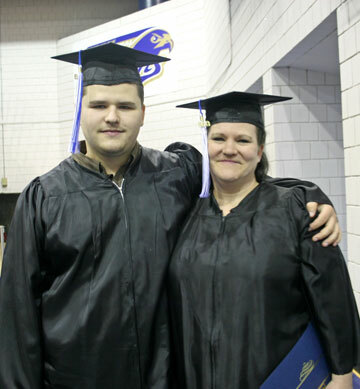 Christine Haynes and her son Grady were among the more than 50 GED recipients who participated in a recognition ceremony at East Central College May 18. The Owensville residents attended classes at ECC’s GED site in Gerald. Over 100 people from the area passed the GED in the past year through ECC’s Adult Education and Literacy program. Union, Mo. - Major changes are on the horizon for the GED test in Missouri. Like programs all across the state, East Central College’s Adult Education and Literacy program will soon be transitioning away from the 2002 paper/pencil version of the GED high school equivalency test and begin helping people prepare to take the new computer based 2014 High School Equivalency test. Pictured left to right; Louis Menz presents a check for $250 on behalf of the Knights of Columbus to Carie Shirley, Teresa Poe, and Andrea Horstmann at Franklin County R-II School. New Haven, Mo. - The Knights of Columbus recently presented both Franklin County R-II and New Haven Schools a $250 donation thanks to their Annual Tootsies Roll Drive. Washington (PRnews) - In one of the most comprehensive studies of parents' views on mobile devices in education, more than 50 percent of parents believe that schools should make more use of mobile devices in education and 32 percent agree that schools should require them in the classroom. These findings are from a new study of how parents perceive mobile learning and devices in and out of the classroom. The Living and Learning with Mobile Devices Study was conducted by Grunwald Associates and the Learning First Alliance and underwritten by AT&T*. Washington, D.C. (PRNewswire) -- Retired generals and admirals who are members of Mission: Readiness are expressing significant concerns about the findings in The State of Preschool 2012: State Preschool Yearbook, released on April 29 by the National Institute for Early Education Research (NIEER). The report found that the 2011-2012 school year was the worst in a decade for progress in access to high-quality pre-K education. Photo courtesy of New Haven School District. 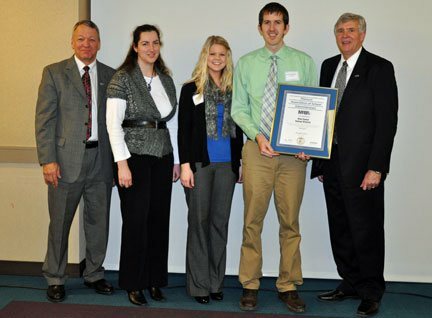 Fifty-four school districts in south-central Missouri who met the criteria established by the Department of Elementary and Secondary Education for Distinction in Performance were recently honored by South Central Regional Professional Development Center. Districts who met the criteria received a certificate of recognition provided by the Missouri Association of School Administrators. Valent Aerostructures, LLC will be reimbursed for up to $275,000 in training costs following approval by the East Central College board of trustees of a New Jobs Training Program agreement. UMB Bank will serve as fiscal agent. The New Jobs Training Program provides a means for companies to be reimbursed for training costs associated with new jobs created in the state. “We are looking forward to the opportunity to work with Valent on their training needs,” noted College President Jon Bauer. Hermann, Mo. - Peoples Savings Bank is announcing the Peoples Savings Bank Scholarship Awards Program. Under the Program, four (4) $1,000 scholarships will be awarded to seniors attending a high school in the cities of Hermann, Montgomery City, New Haven, and Francis Howell High School. Children attending schools meeting the criteria are eligible to apply. COLUMBIA, Mo. — One in five adults in the United States lacks the math competency expected of an eighth grader, according to the United States Center for Educational Statistics. 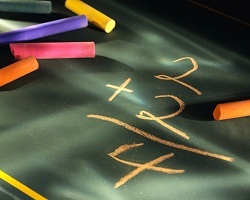 University of Missouri researchers identified how a lack of a specific math skill in first grade correlated to lower scores on a seventh grade math test used to determine employability and wages in adults. Intervention programs designed to overcome this early math deficiency could prepare students for later employment, help them make wiser economic choices and improve the future U.S. workforce.